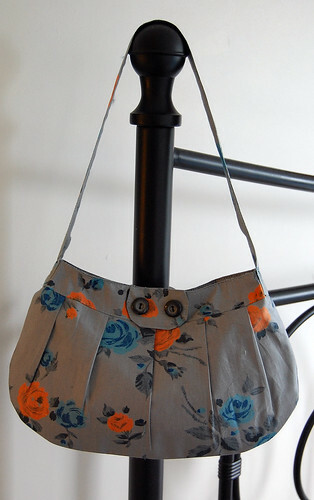 "Buttercup Bag" , originally uploaded by indiaeden. I spotted this great tutorial on whip up the other day and instantly knew I had to make it up in this piece of vintage cotton I've been saving since last years antique textile fair. Really lovely patttern, I'm not usually a little bag girly,but I love this design. I'm not 100% happy with the button tab, that's quite tricky to get right,but it's not terrible,and I doubt anyone else will really notice..I hope! Oh yes, and I scanned this fabric before cutting into it. I love it so much I'm probably going to get it reproduced at Spoonflower sometime, or at least a version of it. I've been looking for a "new" pattern having made so many Dotty bags - think this might be worth a whirl! Liz, it's taken over from the Otty bag as my fave little handbag pattern.